A new interactive online snowmobile safety course is now available in North Dakota through Fresh Air Educators. 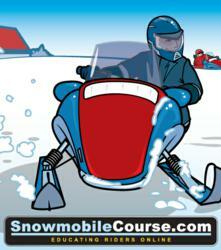 SnowmobileCourse.com features a fully narrated, interactive course that allows students to obtain their North Dakota Snowmobile Safety Certificate online. The professionally narrated course, along with the interactive elements and the visual exam questions are unmatched. The North Dakota Parks & Recreation Department now allows snowmobile safety education on the Internet, through SnowmobileCourse.com. The online course developed by Fresh Air Educators, Inc. features a narrated and interactive study guide, as well as a visual exam and quiz questions. The introduction of the online course is a step toward more safe and responsible riding on the trails. To legally operate a snowmobile in North Dakota, persons ages 12 and older who do not have a valid driver’s license or permit, are required to complete a safety certification course. The online snowmobile safety course not only provides students with a wide range of general knowledge from basic operation to riding safety, but also includes state-specific information such as registration and licensing regulations and legal operation in North Dakota. Matthew Gardner, Education Coordinator for the NDPRD is excited about this new online course. “With the online safety course, young students will have a more interactive and dynamic learning experience, in the convenience of their own homes. We've customized the course curriculum with Fresh Air Educators to ensure that the course meets our exact needs, and we think students will love the narrations and interactive elements." In order to ensure a greater level of student participation and retention, the online snowmobile course is made to cater to all learning styles. The course and exam questions contain hundreds of detailed illustrations, as well as narrated course content and interactive exercises. "Every student, whether they're a visual, auditory, or kinaesthetic learner, will get something out of this course." Adds Moher, "The professionally narrated course, along with the interactive elements and the visual exam questions are unmatched. In the end, 98% of all our students would recommend our courses to friends or family." The online snowmobile safety course has a one-time fee of $29.95, which includes the course, chapter quizzes and unlimited attempts at the final snowmobile safety certification exam for North Dakota. The course is also available to anyone as a free study guide. For more information about Fresh Air Educators or online outdoor education, please visit FreshAirEducators.com.